Epic Woman (Eau de Parfum) is a popular perfume by Amouage for women and was released in 2009. The scent is spicy-oriental. Projection and longevity are above-average. It is still in production. 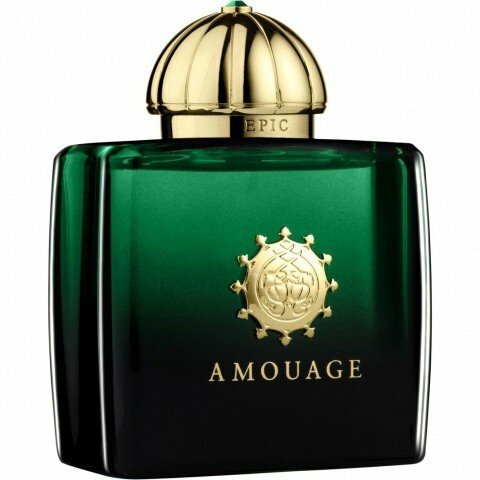 Today I come to Epic Woman of Amouage. Which means "epic" or rather "epic woman, or epic woman" or something similar. Before I freake out here because of the term "epic" and drive everyone away, I'll tell you something about the fragrance and where the inspiration for this fragrance came from. It is about the so-called Silk Road, which was a road (or road network) for caravans transporting precious goods between the Mediterranean and the East, especially between China and Arabia. Silk was the main product traded, hence the name of the street. Of course there were a lot of other luxury products like rare spices, precious metals, woods, oud, tea and flowers like roses. Since the fragrance was inspired by this street, some of the goods traded at that time are also available as fragrances in this fragrance. I also smell light, sweet notes of jasmine (I don't smell the cinnamon), a light peppery note and flowery roses. Not long, and the spices become a little softer, the cumin hardly smells you then really, which particularly pleases me thus. The middle part of the fragrance is basically like the beginning, only that some scents become weaker or stronger. As mentioned, the spices become softer, but can still be smelt well. The tea is now a little better to smell, and while it seemed like green tea to me at the beginning, it smells more like black tea to me now, well, a little spicier than perhaps, which is due to the spices here. Also the roses can now be sniffed out better, which makes the fragrance even more oriental. New, however, are the resinous fragrances, especially the incense, which becomes more and more intense and smells really great. A little later the spices will fade away a little more, which makes the fragrance even softer, especially with the aforementioned resinous incense. Roses are still present, the tea weakens a little and the sweetness of the fragrance is now a mix of jasmine and amber, where the amber becomes stronger in the course of time and the jasmine gradually fades away. Then I also smell woods, namely the gentle, beautiful scent of guaiac wood, which in my opinion has a slightly more beautiful scent than cedar, for example, as well as oud, which in this scent is almost untypical for Amouage but rather weak. The later base is more resinous-woody and sweetish by the amber. All in all, Epic Woman is an excellent and beautiful fragrance that is definitely worth testing. The Sillage is strong, the scent is good to smell. But in general it seemed to me as if this Amouage was a little bit weaker than most Amouage fragrances... well, that's not bad, because the Sillage is still good! The shelf life is, as already expected, quite good, so that the fragrance loosely lasts more than twelve hours. The jade green bottle is rectangular and slightly bloated. On the sides, it looks as if it has been slightly pressed in. On the front you can see as usual the elaborate and gold-plated Amouage logo, the fragrance name can also be seen on the gold-plated neck. The lid has a typical oriental design and therefore looks exotic. It has also been gold-plated and has a green Swarovski stone at its tip. A very nice bottle with a great color. So, hm... so I think that the fragrance smells exactly like you can imagine the goods from the Silk Road, which served as inspiration for this fragrance. Spices, tea, roses, everything that was transported at that time is available, at least everything that could be processed into a fragrance. I myself would have called the name of the fragrance different (for example Silk Woman, silk for silk and silk for the Silk Road), but well. I think it's nice that the fragrance undergoes a great fragrance development and changes from strong spicy to soft resinous, so that you find a nice and varied fragrance in every phase of the fragrance. The fragrance smells wonderful and in my opinion can be used very well in autumn and winter (actually even in spring) both during the day and in the evening. Therefore I would definitely recommend to try the scent! When I first tested it, I thought that I would never call this fragrance my own. Way too loud and pompous with a Monster Sillage. I was wondering where you could wear something like that. So I copied him and dedicated myself to other fragrances. And I have to say, it's true love. According to the motto: what lasts long will finally be good. I love that scent, I've never smelled anything like it. For me it is a deep, dark and earthy scent which nevertheless has a certain freshness and becomes more and more beautiful and softer from hour to hour. Still clearly perceptible after 8 hours. Really with memoir and loukhoum my dearest treasure among my scents. The rose came out first and I loved it (and I'm picky about rose scents), then the other florals became apparent. They blended so well I could not say that any one dominated, except possibly the wonderful rose. The cumin and cinnamon balance with the flowers like yin/yang; the incense/smoke aura grounded the whole flower/spice party. This is FBW. Several years ago, oud fever began spreading like wildfire across the perfume blogs and boards, and like so many others, I was captivated. "Noble rot" they called it, and the tales of how it was harvested and the way it was used in the Middle and Far East made agarwood sound so esoteric and totally covetable that I couldn't resist trying some. Thus, I ordered a bunch of samples from Montale, the only house that was using oud on a large scale at the time. Sadly, my oud testing spree did not go well. The Montale fragrances were without a doubt different from anything I had ever experienced and certainly interesting perfumes. However, I found myself feeling unsettled and borderline anxious whenever I wore them. I eventually figured out that the medicinal, Bactine-like aspect of Montale's oud was reminding me of hospitals, sickness, injury and other unpleasant stuff. "No oud for you!" I thought to myself. 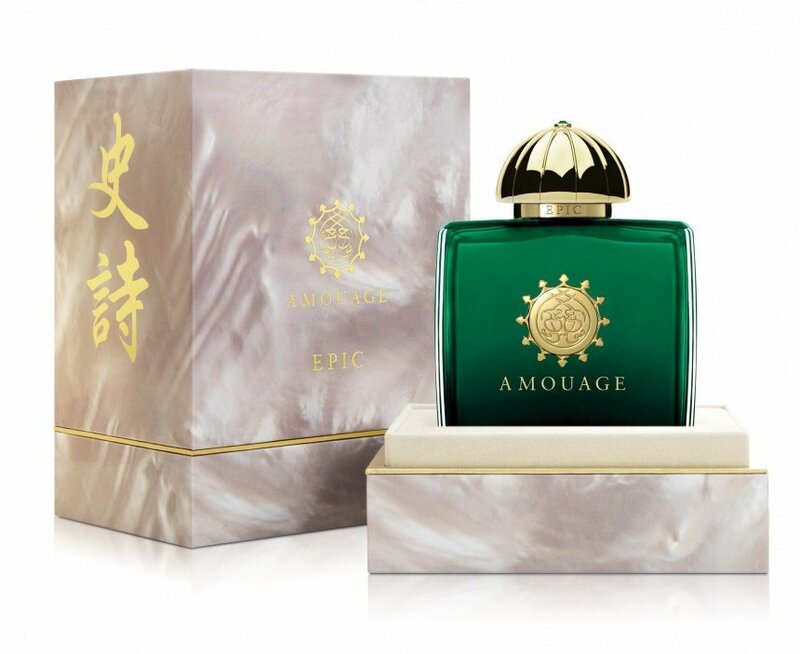 Enter Amouage Epic Woman, which I tested on a whim without even knowing that it contained the dreaded oud. Agarwood (or an aromachemical meant to represent it) is present in Epic Woman from top notes to drydown, but unlike in other settings, the oud here is mellow, a bit sweet and plays well with the other notes. The noble rot descriptor fits perfectly, as the wood has a round, honeyed quality that gives the impression of careful ageing without the medicinal odor. This beautiful note provides the backdrop against which the rest of the fragrance unfolds, at all times enhancing rather than upstaging the other components. Spices, including caraway, pepper and cinnamon abound in Epic, and they have a remarkably fresh quality suggestive of crushing the pods and seeds under a rolling pin as opposed to the dry, musty/stale character found in some spice-laden fragrances. Allegedly, there is a Damascus rose at the heart of Epic Woman, but the floral that I'm able to detect is more of a jam or a liqueur than a natural rose, and all the darker and more rich for it. Epic Woman's base notes include a creamy, buttery note reminiscent of the one featured in Fracas, as well as the magical silver Frankincense that characterizes most of the Amouage line. Although sandalwood is listed, I can't smell any nasty Polysantol, only an earthy whiff after a few hours of what I assume must be Gaiac wood. The sillage and longevity of this perfume are appropriately epic, as they ought to be for the price. Speaking of which, if loving this expensive juice means a month of eating Ramen in a styrofoam container instead of a proper and civilized lunch, I consider it well worth the sacrifice. He sees a rich woman in a fur coat. It projects money he says. Money that comes in the family through generations. Now he makes me feel like getting my self a decant at list. like the colder it gets the better is the perfume. I am delighted to be able to affirm that EPIC WOMAN really is an oriental perfume—and a nice one at that! This composition boasts a big dose of patchouli, for better or for worse. For this nose, it’s definitely for the better, serving as it does to impart the thick richness I look for in and have come even to expect from oriental perfumes. The patchouli here is chewy and clean, not dark and skanky at all, but let the prospective wearer beware: this is essentially a patchouli perfume. The other oriental notes, including pepper, cumin, frankincense, and cinnamon, are all very light complements to the focal note: patchouli. The florals, too, serve to accent the patchouli, not the other way around. The smell is Orient purely like a beautiful Arabian night. The spices dance around my nose. Incense and Patchouli wrap me in a cashmere blanket. An crazy composition; coordinated fantastically; nothing is wrong, balances everything perfectly. The smell warms me, comforts me, makes me happy. I would like to spray him on my clothes and bedlinen. Epic Woman is divine and a Must-Have. According to Medusa and Turandot terrific comments, last night, I 'only' had handed in my assessment. Today, I have a little precious smell sprayed on again. I was fast in the Tales of the Thousand and One Nights disappeared. and amber then the previous reviewed Lyric Woman with it's dry smoky and woodish nuances. and with the earthiness of orris makes it an grounded ending.